Nurse consultants are experts acting as a liaison between clients, physicians, and attorneys. The various duties that are carried out by these consultants include – performing assessments of nursing and hospital facilities, providing testimony relating to nursing and healthcare, offering information on legal issues concerning medical fraud, personal injury risk management, and workers compensation etc; various other roles and responsibilities include – reviewing documents, interviewing witnesses, preparing exhibits list, assessing damage and supporting trails. 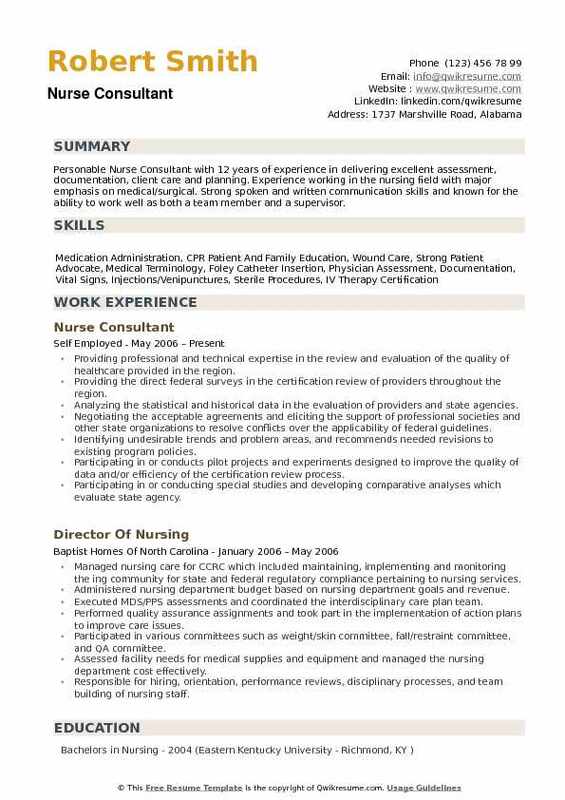 Candidates interested in this line of work task should mention in the Nurse Consultant Resume abilities such as nursing expertise, confidentiality, legal knowledge, computer literacy, in-depth knowledge of legal medical issues and the best practices concerning it; excellent communication and negotiation skills. To become a successful nurse consultant, the candidate should be a registered nurse in the first place and have an education background relating to an associate or four-year college degree in nursing science. Summary : Nurse Consultant III with 18 years of experience in the Medical domain is seeking to secure a position as a Registered Nurse that will allow me to provide compassionate care and wellness education in a sound professional environment. 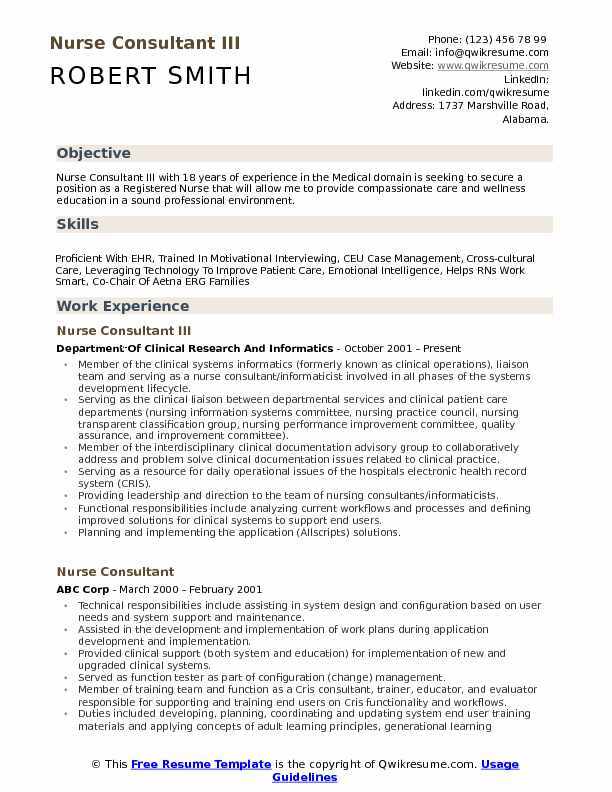 Member of the clinical systems informatics (formerly known as clinical operations), liaison team and serving as a nurse consultant/informaticist involved in all phases of the systems development lifecycle. Serving as the clinical liaison between departmental services and clinical patient care departments (nursing information systems committee, nursing practice council, nursing transparent classification group, nursing performance improvement committee, quality assurance, and improvement committee). Member of the interdisciplinary clinical documentation advisory group to collaboratively address and problem solve clinical documentation issues related to clinical practice. Serving as a resource for daily operational issues of the hospital's electronic health record system (CRIS). Providing leadership and direction to the team of nursing consultants/informaticists. Functional responsibilities include analyzing current workflows and processes and defining improved solutions for clinical systems to support end users. Planning and implementing the application (Allscripts) solutions. Headline : Patient-focused Senior Nurse Consultant with 05 years experience in the Medical Domain. With a knack for simplifying complex problems and developing creative solutions. Reviewed the documentation and evaluated the potential quality of care issues based on clinical policies and benefit determinations. Considered all documented system information as well as any additional records/data presented to develop a determination or recommendation. Evaluated the documentation/information to determine compliance with clinical policy, regulatory and accreditation guidelines. Accurately applied the review requirements to assure case is reviewed by a practitioner with clinical expertise for the issue at hand. Pro-actively and consistently applies the regulatory and accreditation standards to assure that activities are reviewed and processed within guidelines. Condensed the complex information into a clear and precise clinical picture while working independently. Reported the audit or clinical findings to appropriate staff or others in order to ensure appropriate outcome and/or follow-up for improvement as indicated. 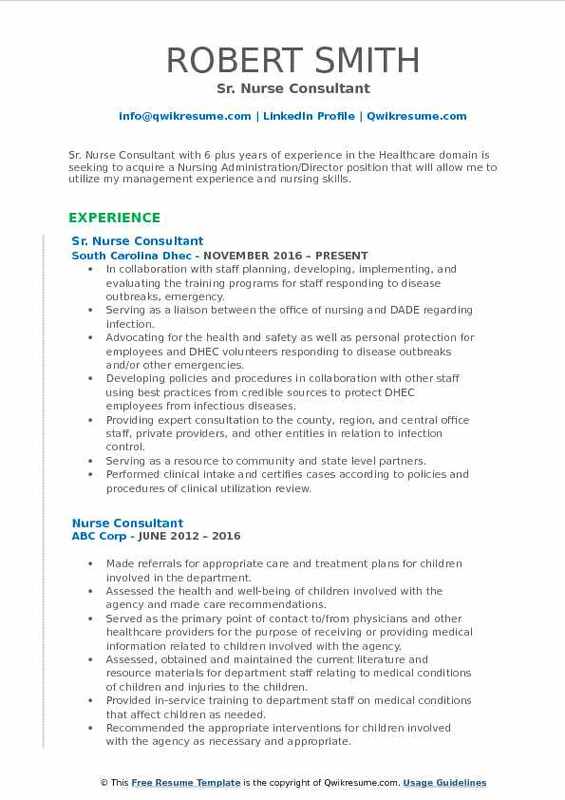 Summary : I have 29 years of experience in several areas of nursing. I enjoy learning new things and appreciate change as it is necessary in the healthcare industry in order to provide quality care and services to those we serve. Worked in coordination with benefit integrity and data analysis partners to identify patterns and/or trends of provider services and billing that could possibly indicate fraud, waste, and abuse of the Medicare trust fund monies as part of a ZPIC. Coverage guidelines and regulations and apply this knowledge to assigned pre and post payment medical reviews. Served as an educational resource for internal and external customers regarding inquiries about medical diagnoses, appropriate clinical interventions, and provider. Participated in on-site visits to providers in collaboration with investigations which included interviewing providers and associates, observation of providers physical location and equipment and assisted in developing interview questions based on the specific services the provider rendered and billed. Provided consultation to the nurse case managers and another multidisciplinary team on treatment plans and goal to help improve nursing practices, and standards of care for individuals residing in a state supported living center. Documented and reported potential quality and risk management concerns to the quality improvement coordinator. Accurately determined eligibility and benefits from several insurance schedules. Referred cases not meeting criteria to the appropriate physician reviewer within the allotted timeframe. 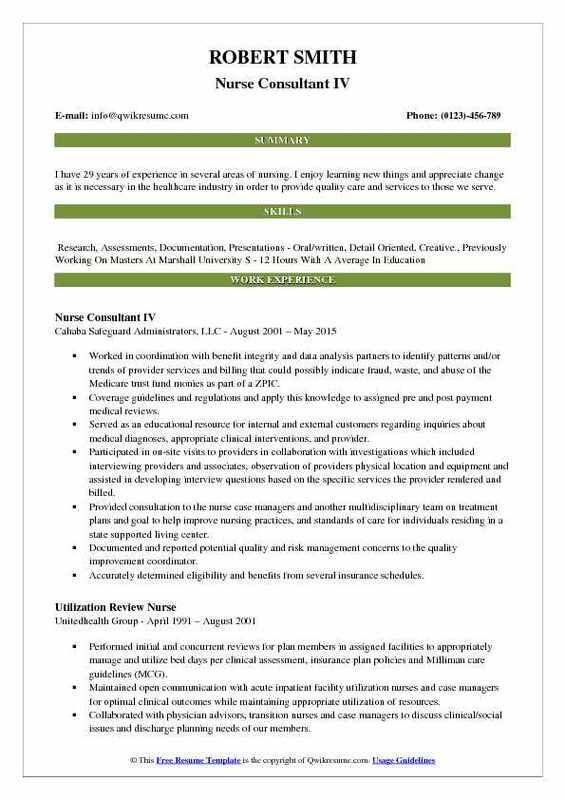 Headline : Sr. Nurse Consultant with 6 plus years of experience in the Healthcare domain is seeking to acquire a Nursing Administration/Director position that will allow me to utilize my management experience and nursing skills. Skills : Patient Chart Management, Patient Information, Bilingual In English And Spanish, Patient Discharging, Microsoft Outlook And Operating Systems. In collaboration with staff planning, developing, implementing, and evaluating the training programs for staff responding to disease outbreaks, emergency. Serving as a liaison between the office of nursing and DADE regarding infection. Advocating for the health and safety as well as personal protection for employees and DHEC volunteers responding to disease outbreaks and/or other emergencies. Developing policies and procedures in collaboration with other staff using best practices from credible sources to protect DHEC employees from infectious diseases. Providing expert consultation to the county, region, and central office staff, private providers, and other entities in relation to infection control. Serving as a resource to community and state level partners. Performed clinical intake and certifies cases according to policies and procedures of clinical utilization review. Reviewing the medical records and providing information to department staff members regarding medical conditions, treatments, and potential outcomes. 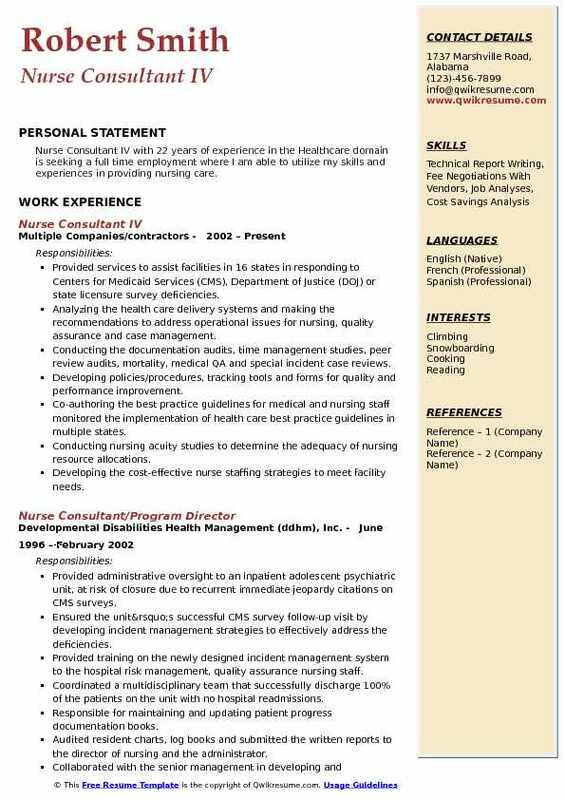 Summary : Registered Nurse Consultant II with 18 years of experience in the Health Care industry with experience in state/federal regulations, wound care standards of practice, departmental budgeting, educating/teaching skills, public speaking, team management and patient care. Has experience with multi-generational skills and abilities entwined with interpersonal skills that reflect appropriate care and management of the population in each stage in the life cycle. Registered nurse consultant, responsible for managing all aspects of nursing education. Working in an autonomous environment with the discipline and ability to perform job requirements in accordance with ICPS mission and philosophy. Educating long-term care staff presenting inservices on various topics relative to long-term care issues. Developing and evaluating continuing education programs for nurses and administrators through the Ohio league of nursing (OLN), and NAB (National Association of long-term care administrator boards). Developing and updating ICPS policy and procedures pertaining to intravenous therapy and wound care. Overseeing appropriate wound management, encompassed with adequate documentation according to state / federal regulations, and standards of practice, national pressure ulcer advisory (NPUAP), and wound ostomy and continence (WOCN), within facilities. Working closely with staff wound care nurse and nursing staff with a primary focus on prevention. Providing clinical recommendations to physicians, working closely with them to assist the facility in the care and management of wounds according to cms guidelines and state regulations. 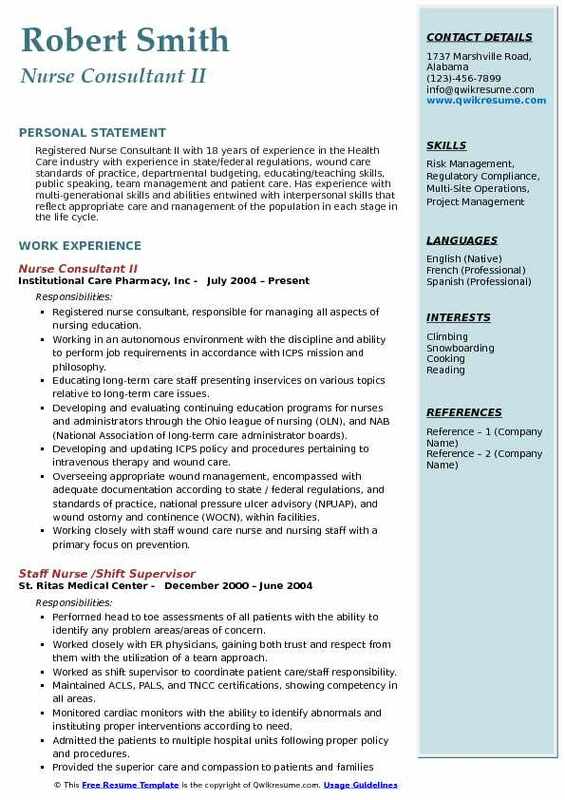 Headline : Nurse Consultant with 6 plus years of experience in the Healthcare domain is seeking to build a long-term career in the healthcare industry with opportunities for advancement and to use my skills and expertise in the best way for helping my company achieve its mission, vision, and goals for success. Assessing and timely adjudicating the complex medical health issues for those traveling to areas with limited medical care facilities and consults with other health care professionals as necessary. Analyzing the medical diagnosis and referring the individuals to appropriate resource. Knowledge of travel medicine, medical clearance determination, and preventive health assessment. Knowledge of global epidemiological disease and ensuring that immunization records are up to date for foreign service employees and eligible family members. Identifying the specific health needs and medical conditions that may require special management, follow-up or monitoring. Experience in assessing special needs patients and situations requiring program management intervention. Initiating mental health and CFP consults as needed. Experience conducting independent research, literature searches, and analysis to determine long-term implications of medical surveillance and reasonable accommodation interventions. Recognizing the expert sources and discussing the medical conditions with other medical professionals to determine which immunizations are necessary for traveling overseas. 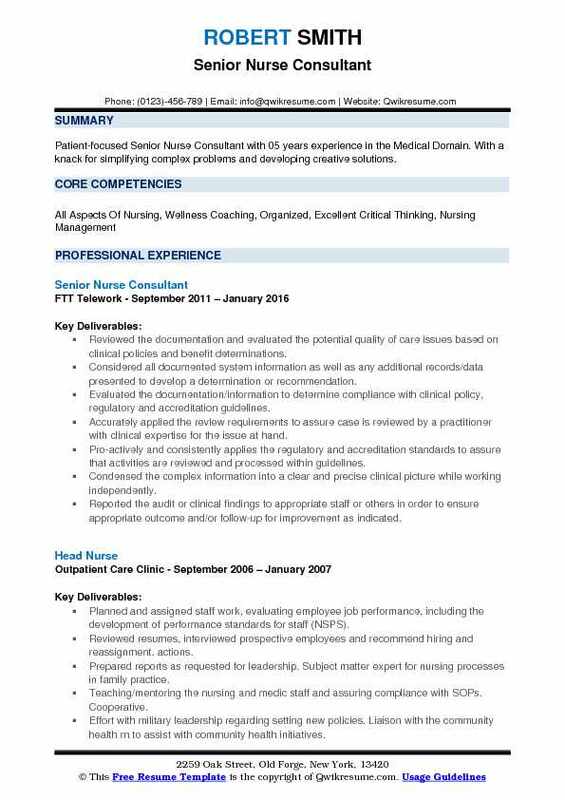 Summary : Nurse Consultant I with 10 plus years of experience in the Healthcare domain is looking to obtain a full-time position which allows me to apply my many years of experience in both patient care and clinical research. Working within an assigned team and in accordance with CMS and state survey protocols, to conduct complex surveys of nursing facilities, ensuring compliance with federal and state regulations are being met. Conducting the program monitoring of activities to ensure compliance with federal regulations and state codes, standards, and guidelines, for licensure/ certification and eligibility for Medicare and Medicaid participation. Investigating and assessing the facility complaints and conducting the follow-up and surveillance visits. Determining the level of federal deficiencies and identifying possible patterns of inadequate care. Performing assessments of all areas affecting the resident quality of life, including infection control practices, dietary practices, medication preparation and administration, and resident rights. Documenting the findings and preparing written assessments outlining areas of deficiencies and compliance violations. Facilitating meetings with facility management, regarding survey results and plan of correction. 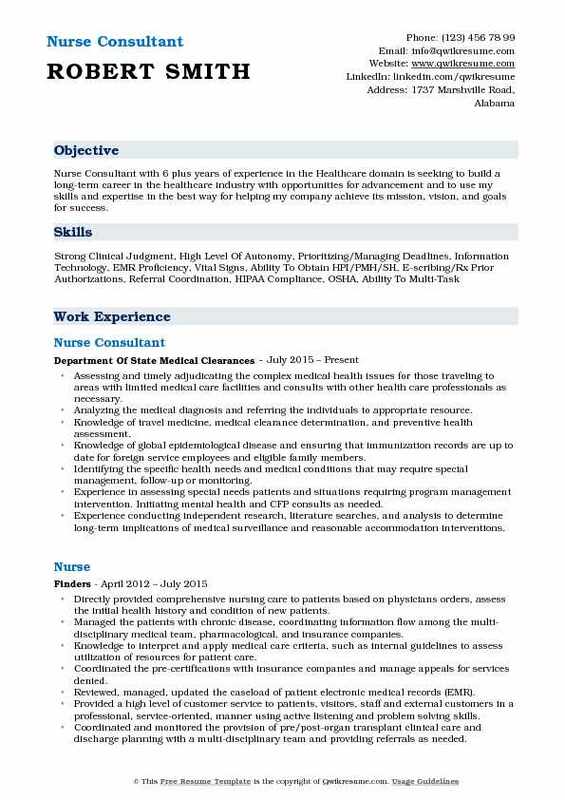 Summary : Nurse Consultant II with 18 years of experience in the Healthcare domain. Proven record of reliability, caring and responsibility, resourceful and a problem solver, capable of implementing solutions to complex problems. Ability to remain calm and professional throughout critical situations. Effective rapport builder with clients, families, and staff. Excellent communication and organization skills. Precepting/mentoring new nurse consultants at current employer and wound care nurses in skilled nursing facilities. Managing schedule/autonomy as a consultant. Attending national, state, and local conferences / continuing education programs to keep updated both personally and professionally related to all healthcare issues. Sharing new information with members of the nursing team and assigned facilities to enhance knowledge and growth within the healthcare profession. Interpreting the MCI (medical capacity information) guidelines for foreign post approvals and proficient in the emed2 medical software. Receiving and processing the bid-lists for foreign posts and forward lists of approved and un-approved posts after researching capabilities of foreign posts health units. In-depth knowledge and experience of travel requirements, regulations and guidance and ability to research internet sites. Sending the medical clearance notifications on a weekly basis and perform on-call duties as assigned. Communicating effectively with clients and external customers obtaining medical histories and other pertinent information. Preparing the chronologies of medical records using self-direction and acute judgment skills. 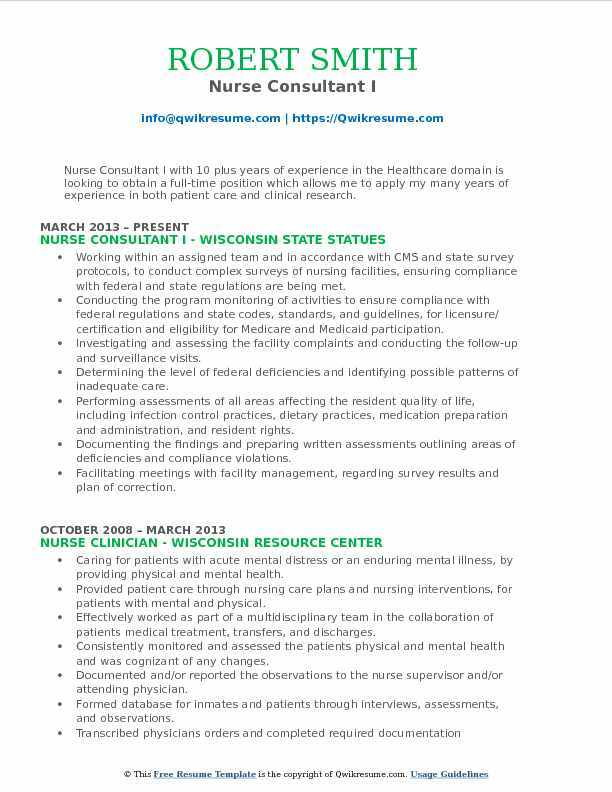 Summary : Nurse Consultant IV with 22 years of experience in the Healthcare domain is seeking a full time employment where I am able to utilize my skills and experiences in providing nursing care. Provided services to assist facilities in 16 states in responding to Centers for Medicaid Services (CMS), Department of Justice (DOJ) or state licensure survey deficiencies. Analyzing the health care delivery systems and making the recommendations to address operational issues for nursing, quality assurance and case management. Conducting the documentation audits, time management studies, peer review audits, mortality, medical QA and special incident case reviews. Developing policies/procedures, tracking tools and forms for quality and performance improvement. Co-authoring the best practice guidelines for medical and nursing staff monitored the implementation of health care best practice guidelines in multiple states. Conducting nursing acuity studies to determine the adequacy of nursing resource allocations. Developing the cost-effective nurse staffing strategies to meet facility needs. Developing educational programs and provided training to medical, nursing and other professional staff on: best practice guidelines, risk management and continuous quality improvement processes, quality of care issues, discharge planning, incident management, case management, fundamentals of support coordination, person-centered planning, advance care planning, end of life issues, regulatory compliance and infection control issues. Summary : Personable Nurse Consultant with 12 years of experience in delivering excellent assessment, documentation, client care and planning. Experience working in the nursing field with major emphasis on medical/surgical. 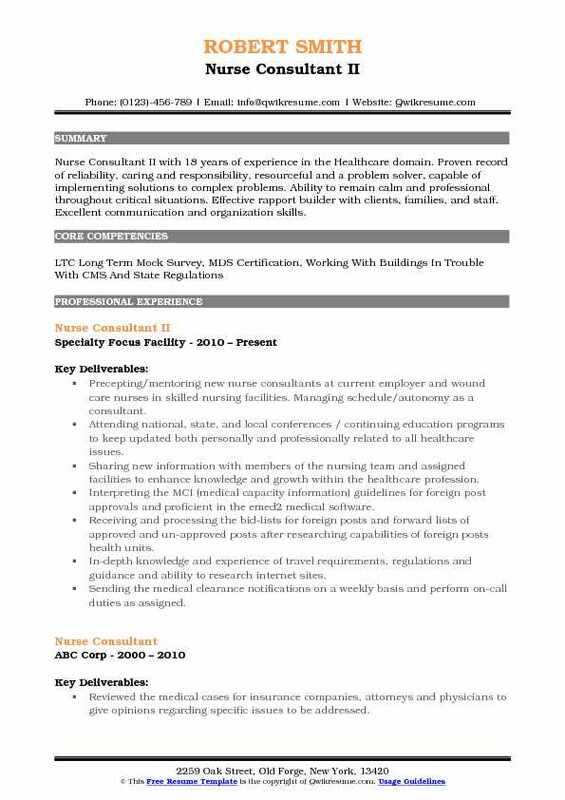 Strong spoken and written communication skills and known for the ability to work well as both a team member and a supervisor. Providing professional and technical expertise in the review and evaluation of the quality of healthcare provided in the region. Providing the direct federal surveys in the certification review of providers throughout the region. Analyzing the statistical and historical data in the evaluation of providers and state agencies. Negotiating the acceptable agreements and eliciting the support of professional societies and other state organizations to resolve conflicts over the applicability of federal guidelines. Identifying undesirable trends and problem areas, and recommends needed revisions to existing program policies. Participating in or conducts pilot projects and experiments designed to improve the quality of data and/or efficiency of the certification review process. Participating in or conducting special studies and developing comparative analyses which evaluate state agency. Determining the need for training and technical assistance to state agencies and providers for the purpose of upgrading performance capabilities of state surveyors and providers. Collaborating with other in-house disciplines and outside providers such as the MD, pharmacy, nursing homes and hospitals.